TINO has been in the industry since 1992. He has won numerous awards in house and was awarded an Tilecraft Excellence in Design Award for the Commercial Category. Putting ideas together is his passion and his greatest skill. He will help you put the pieces together. 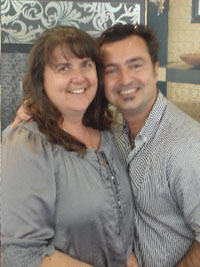 TANYA has been in the industry since 1992, and with Tino looks after the accounts and administration for the business. You will probably hear her voice more than you will see her face. She looks after the back office operation and may let you know when your order is in and available for pick up. Welcome! This is our dedicated Team of design consultants. Did we say that we would love to help your renovation project? Come and visit our Showroom today! LUCY has been in the industry since 1993.She has won several awards including the Tilecraft design excellence award in the category of Residential Design. She is friendly and patient and always offers the best possible service. She has put selections together for jobs as small as a kitchen splashback to those as large as 35 units. She treats all jobs with the same level of enthusiasm. 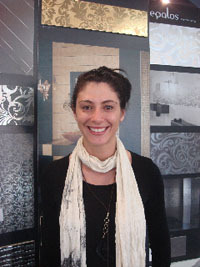 REBECCA has a Bachelor of Commerce B.Com (UWS) and is currently studying for a Bachelor of Interior Architecture (UNSW). VASKO the newest member of our team who has been with us through 2011. His natural flair is with colour and design and his previous experience in the field of photography. He has already created a variety filled portfolio showcasing great design using texture and colour. 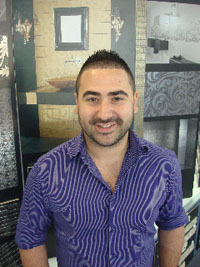 He is outgoing and customer focused and makes selecting your new tiles a fun and knowledgable experience.